Air Jordan 5 matching Sneaker Match Tees ® Collection. 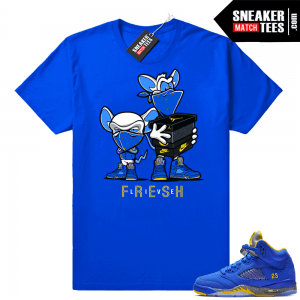 Sneaker Match Tees ® Collection of shirts designed to match the Air Jordan 5, new Jordans 5, and new retro 5 releases. Featured is custom sneaker tees designed in the Air Jordan 5 Blue Suede. Including recent colorways of the Red Suede 5s, Olympic 5s, Space Jam 5s, Bronze 5s and more. Browse our Categories for entire list of Air Jordan 5 releases.